Navodaya Vidyalaya Samiti /NVS Recruitment Answer key, Results, Merit List 2017 / Navodaya Vidyalayas Principals, PGTs, TGTs Cutoff marks : Download OMR Sheet & Answer keys for the written examination held on 11.12.2016 for the post of PGTs, TGTs, Assistant Commissioners Misc. Category and IIIrd language teachers in NVS. NVS Result 2017, NVS PGT Result Name Wise, NVS TGT Result 2016 Name Wise, Navodaya Vidyalaya Samiti Cut Off, NVS Cut Off Marks, Navodaya Vidyalaya Merit List . : Navodaya Vidyalaya Samiti, henceforth mentioned as NVS, an autonomous organization under the Ministry of Human Resource Development, Govt. of India invited online applications from 10-09-2016 (08:00 hrs) to 16-10-2016 (from Indian citizens for recruitment to the posts of Assistant Commissioner, Principal, PGTs, TGTs, Miscellaneous Teachers and TGTs (III Language) for the year 2016. 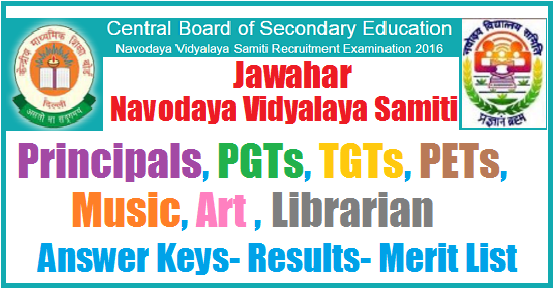 A Large number of candidates has applied for Post Graduate Teacher (PGT) and Trained Graduate Teacher (TGT) this year in Navodaya Vidyalaya Samiti (NVS) 2016 recruitment process for the following Post of Assistant Commissioner, Principal, TGTs, PGTs, Miscellaneous 3rd language Exam Conduct on 11 December 2016. Higher officials of NVS recruitment team have posted this notification. the Complete Detail Regarding the NVS Result 2017 Date latest News & Merit List, key, results details are given here. Navodaya Vidyalaya Samiti, henceforth mentioned as NVS, an autonomous organization under the Ministry of Human Resource Development, Govt. of India invited online applications from 10-09-2016 (08:00 hrs) to 16-10-2016 (from Indian citizens for recruitment to the posts of Assistant Commissioner, Principal, PGTs, TGTs, Miscellaneous Teachers and TGTs (III Language) for the year 2016. NVS Assistant Commissioner and Principal Examination scheduled to conduct to be on 04-12-2016 and NVS PGT, TGT, TGT Miscellaneous, TGT (IIIrd Language) Examination scheduled to conduct to be on 11-12-2016 . The answer keys along with the OMR sheets have been released by the Central Board of Secondary Education (CBSE). Those who had appeared for the examination held on 11 December 2016 can also raise their objections against the answer keys released by the Board. The examination was held for recruitment to the posts of PGT/ TGT/ Misc.Category Teachers/ Third Language Teachers. Candidates can download the results,merit list,answer keys of Navodaya Vidyalayas Principals, PGTs,TGTs, PETs, Music, Librarian Posts from here. Navodaya Vidyalaya /NVS Recruitment PGTs, TGTs, Assistant Commissioners Misc. Category and IIIrd language teachers Cut Off Marks has been decided by authorities of NVS and will be declared when the result will declare. For the next round of selection procedure and check official site. Candidates visit the official site daily so that they can get all latest news for NVS exam very soon. NVS PGT Result 2017 Published on their official site so that all candidates may get this information that NVS has a number of vacant posts for PGT and TGT. 2. Click on NVS TGT PGT 2016 Exam Result. 3. Now, enter your registration number and password and submit them. 4. You will see your Navodaya Vidyalaya Samiti Result and cut off marks for each category also . 5. Download NVS Result 2017 and take print of it for further use.